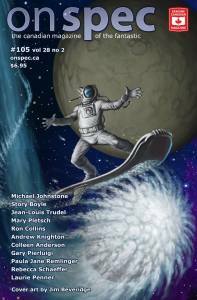 I am very pleased to announce that my short story “A Fire Across the World” will be published in an upcoming issue of On Spec, the Canadian magazine of the fantastic. This is just a short note to mark the occasion. I’ll post details of the publication date and issue number when I have them. A couple of administrative notes: first, I’ve taken the opportunity to update my Upcoming and Works in Progress pages on this site, in case anyone is burning to know what I’m up to. Second, I’m going to post a newsletter this week which for once will include some kind of big news. Big for me, anyway. It’s something I’m not going public with for a while, so if your curiosity is somehow piqued by this vagueblogging nonsense, you’ll have to subscribe to my newsletter to get the details. Which you could do right here, if you were so inclined. This entry was posted in Announcements, Writing news and tagged a fire across the world, on spec. Bookmark the permalink. Congrats, Dave! Looking forward to hearing your ‘big news’.